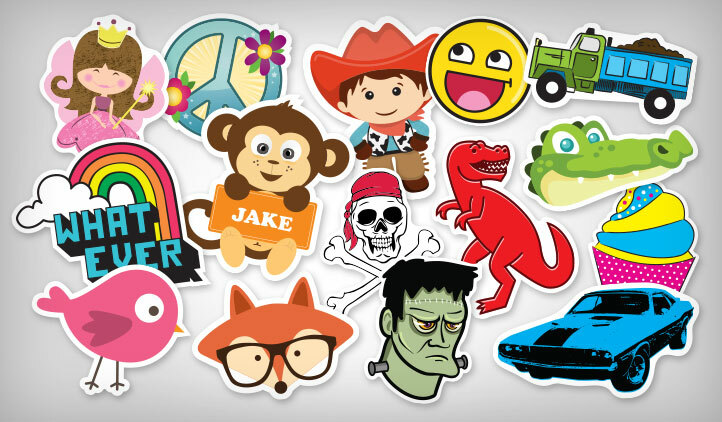 Make kids stickers at StickerYou! Letter stickers, name stickers, star stickers, dinosaurs, cats, animal stickers, and more! Make personalized kids stickers for their bedroom walls, doors, drawers, helmets, lunch boxes, or just for fun. For their next birthday party, to stick on notebooks, lockers, for decorating, or for the holiday season, kids love stickers for, and on, just about anything. For party planning, make stickers to match the theme of your kid’s birthday. Whether you’re trying to match colors, designs, or characters, you can match them all. All you have to do is upload your artwork to the sticker maker and all your stickers will match. If you’re looking to make name labels for each of the guests for the dinner table and want to use the same character, animal, or symbol, simply use the old sticker maker classic. In there, you can fill the page with the icon of your choosing, then one by one, change the names on each of the labels for all the party guests. While you’re at it, include those party hats, with a sticker, even their name, on it to have some fun! While stickers are fun, they can help encourage kids to learn and stay organized without even realizing it. Make sticker charts, so they can keep track of their daily chores, or alternately, make chore charts where their reward for a completed task is their choice of sticker. Try sticking apple stickers, grapes, carrots, and other fruits and vegetables on the fridge with the names below, so kids can learn the different fruits and vegetables as they eat them. StickerYou’s’ kids stickers stick strong and last long on just about anything, are weather-resistant, and will endure the fridge, freezer, even the dishwasher, leaving you with many different opportunities for sticker sticking fun!